Virtual reality has been in the news a lot lately, and now the news is in virtual reality. The New York Times is jumping into the VR pool with the launch of NYT VR, a new virtual reality app created in collaboration with Google and VR studio IM360. The app will be used to deliver immersive editorial as well as advertising experiences to viewers with smartphones, compatible with both iOS and Android devices, and launches with several major ad sponsors already on board. The NYT VR service debuts with a documentary film, “The Displaced,” about three children whose lives were uprooted by war in South Sudan, Ukraine and Syria. The New York Times Magazine produced the film in collaboration with virtual reality company Vrse, founded by VR media pioneer Chris Milk. Another film takes the viewer inside the making of the magazine’s “Walking New York” cover story. On the advertising side, NYT VR has lined up launch sponsors including GE and Mini, which have both produced VR films for the app. The GE film explores the connection between design, industry and nature, and was produced by the NYT’s T Brand Studio working with VR studio Framestore. Mini is showcasing two VR films that address the impact of VR on storytelling and media. To help readers experience the new VR media offerings, the NYT is distributing over a million Google Cardboard viewers to home subscribers on the weekend of November 7. It is also making the viewer available for free to Times Insider subscribers with promotional codes delivered via email. 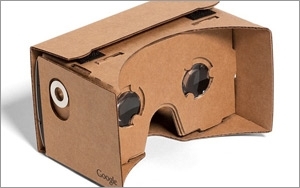 The Google Cardboard viewers allow users to turn their smartphone into a simple VR headset. Google has also published instructions for consumers to make their own VR headsets at home. The NYT isn’t the only publisher taking the VR plunge. Two weeks ago, Time Inc.’s InStyle magazine announced a partnership with Jaunt, a company that produces cinematic VR experiences. The new feature, called InStyle Virtual, will allow viewers to immerse themselves in the magazine’s fashion shoots and other events in the world of celebrity glamour.